The best deals and services, right at the touch of your fingertips. Being owned and operated by technical minded people means we provide service for every need. We use the latest hardware and equipment – you’ll never go wrong with our Dedicated Server hardware! Need something smaller than a smart or dedicated server? 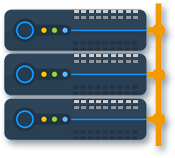 Check out our Virtual Servers. For users who need the power of a dedicated server at a lower price, our Smart Servers have you covered. Have your own server equipment? Host it in one of our state-of-the-art datacenters. You can find some of the reasons to bring your services to us below! Every customer, regardless of size, receives personal attention from a key account executive dedicated to their account. You will always be able to contact them for assistance. Even with our industry low prices, we still believe in providing proper technical support around the clock to all our customers. Support is offered over a few mediums. A key component of a datacenter is the network on which it relies. We utilize datacenter-grade gear that you can trust such as Brocade and Cisco brand hardware. Our facilities feature around-the-clock security with bio-metric and key card access control, including man-traps and cab locks for peace of mind. Feel free to give us a call anytime. Follow us throughout the web and stay updated with the latest news. Subscribe to receive updates and new deals as they become available! © Copyright 2019 ServerDeals, a brand of Nexeon Technologies, Inc.